A few festive looks for Christmas. These suede bow pumps are 40% off! Both great looks. 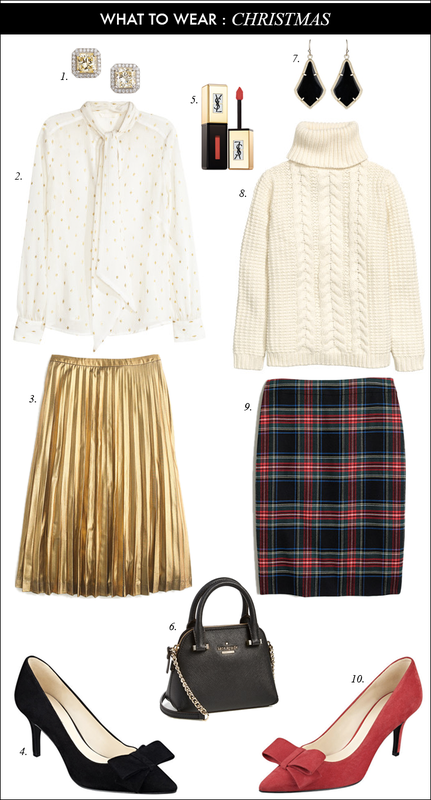 The cable knit and tartan skirt is definitely something I would wear for Christmas! Loving that plaid pencil skirt! that gold skirt is perfection! Both perfect festive looks, I'm loving the gold pleated skirt and both of those adorable bow heels! Love both of these outfits! That gold skirt is so fun! I love the gold outfit! It looks so luxe and glam! So pretty! I love the cream turtleneck with the plaid skirt! You are so good at what you do with these posts. Love the cable knit with the plaid skirt. So fun with a little bit of the unexpected.